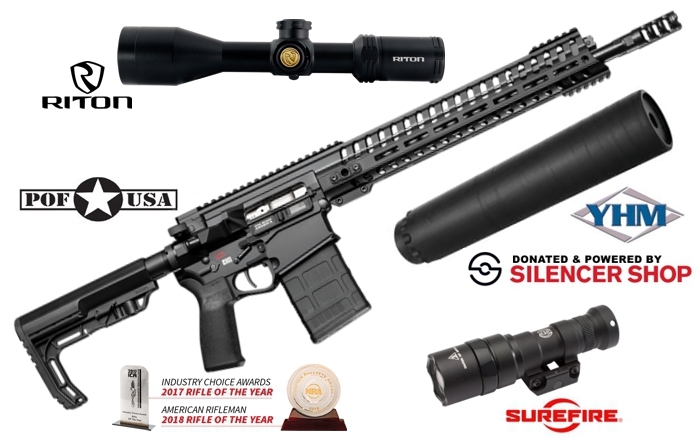 **** Chosen by Winner: David M.
The Patriot Ordinance Factory REVOLUTION™ ($2669.99) is our new .308 rifle that handles like a 5.56 – because it’s the same size and weight as one. This isn’t a stripped down rifle that’s saving weight by making extra cuts or lacking the battle rifle features you’re accustomed to. We’ve worked Patriot magic into the Revolution by using a 5.56 bolt carrier and other 5.56 parts allowing for a shorter overall receiver size and reduced weight. Yankee Hill Machine's Resonator suppressor ($630) donated by Silencer Shop is their new .30 caliber sound suppressor. It was created to provide the shooting enthusiast a quiet, lightweight and cost effective suppressor. Capable of being used on multiple calibers and host weapons. The RESONATOR can be used on rifle calibers ranging from .17 HMR through 300 RUM making it a great choice for all shooters. Like the Turbo®, the Resonator uses a tubeless design which consists of heat treated 17-4 stainless steel and a heat treated 718 Inconel blast baffle which allows the suppressor to be full auto rated and designed for rigorous use. Includes YHM-4302 Q.D. Mount of your choice. The Surefire M300 Mini Scout ($299) is a powerful, lightweight weapon-mounted light—powered by a single 123A lithium battery—that features a virtually indestructible LED, which generates 500 lumens of light focused by a TIR lens into a high-intensity beam with plenty of reach for close- to mid-range operations. The rugged M300 easily and securely attaches to MIL-STD-1913 Picatinny rails via its integral thumbscrew clamp and is activated by clicking its pushbutton tailcap switch or pressing its pressure-activated tape switch, included on appropriate models. Machined from lightweight aerospace aluminum with a Mil-Spec hard anodized finish and O-ring sealed to keep out the elements, the ultra-compact M300 will withstand the rigors of combat without weighing down your weapon.